The Oculus Rift Development Kit 2 is the latest development kit for the Oculus Rift with a low-persistence OLED display and low-latency positional head tracking. With Cineveo VR Cinema, you can put you inside a virtual movie theater for watching videos in 2D or 3D on huge screen on your seat. Suppose you have a large DVD collection, it should be such a cool thing to enjoy DVD movies on Oculus Rift DK2 in Cineveo VR Cinema. In this article, we will show you how to rip DVDs to Oculus Rift DK2 for viewing with 3D effect. Since Oculus Rift DK2 does not include a drive for playing DVDs. In order to get DVD files onto Oculus Rift DK2, what you need to do is to rip DVD to Rift DK2 compatible videos (the Rift DK2 by default supports most common file formats including AVI, MP4, MKV, WMV, etc). 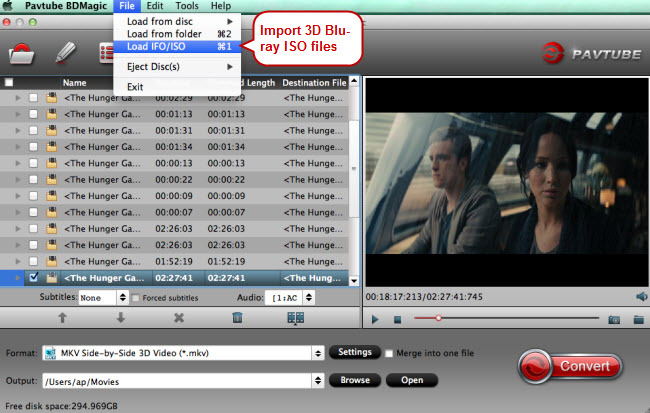 Here Pavtube BDMagic for Mac is highly recommended for Mac users to do the job. It would be the suitable application to complete the process of ripping DVD movies to Oculus Rift DK2 supported 3D MP4, WMV, MKV, AVI, MOV, etc with fast speed and excellent output quality. 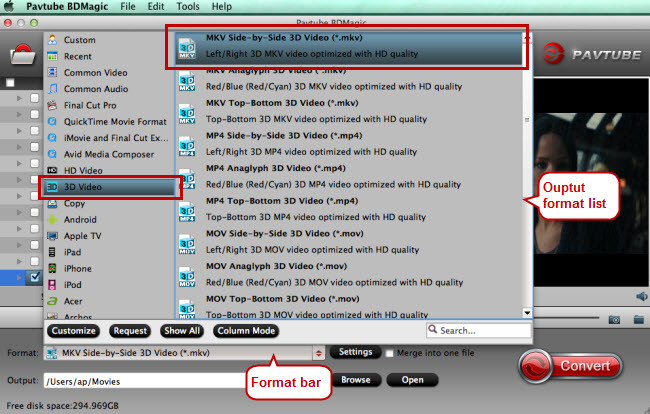 It offers you numerous 3D effects to decide on as (See Differences Between Anaglyph 3D and SBS 3D). It is simpler to use, less steps, but just as many options if chosen. In addition, this Blu-ray/DVD ripping tool can also convert Blu-ray and DVD to various popular video formats like AVI, MP4, WMV, MPEG, MOV, FLV, MKV, 3GP, etc. as well as rip BD/DVD to optimized video for playback on iPad, iPod, iPhone, Blackberry, Xbox 360, PS3, Galaxy Tab and more. If you are a Windows user, read this review to choose. Now download the right version and follow the tips below to finish your task. Insert the DVD disc into your computer’s DVD drive and click the “Load DVD” button on to select and load the DVD movies you want to play on Rift DK2. ISO and IFO files are also supported. After the movies are loaded, you can preview them on the right viewing window and adjust volume or take snapshots freely. As we mentioned above, Rift DK2 supports AVI, MP4, MKV, WMV, etc format. You can click the “Format” bar and choose one from “Common Video” list. If you want to play 3D movie with Rift DK2, you can choose an output format from “3D Video” profile list. Click the “Settings” icon and you will go into interface named “Settings”. You can adjust codec, aspect ratio, bitrate, frame rate, sample rate and audio channel as you like. For ripping DVD to view on Rift DK2, 2D videos for the Cinema app should be in 720p (1280*720) with a higher bitrate around 5mbit/s. When you have finished all the above settings, you can simply click the Convert button on the main interface and let the software do the DVD to Rift DK2 MP4 conversion for you. After the conversion, click “Open” icon to locate the converted video files and then get start with Oculus Rift DK2 and watch them Oculus Rift Developers Kit Dk2 with VR player in Cineveo VR Cinema with ease.